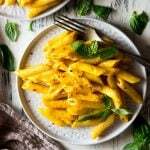 Creamy butternut squash pasta made with roasted butternut squash, garlic and parmesan. The thick and creamy sauce (that's pretty hard not to eat straight from the bowl) is tossed with penne pasta for a quick and incredibly delicious dinner the whole family will enjoy! Pre-heat the oven to 180°C/350F/gas mark 4. Cut the skin off the butternut squash and cut into medium-sized cubes. Place on a baking tray with the garlic cloves (skin still on). Sprinkle over the oregano, red pepper flakes, paprika and a pinch of salt and pepper. Add the olive oil and rub over the squash with your hands so the squash and garlic are evenly coated in the spices. Roast in the oven for around 30 minutes until the squash and garlic are soft, toss halfway through. After 20 minutes of roasting the squash bring a large pot of salted water to the boil. Add the penne and cook according to instructions until al dente, drain. Tip: Reserve 1 cup of pasta water before draining, see notes. Once the squash is cooked, place in a food processor. Squeeze the garlic out of their skins and add that to the squash. Blitz until it's smooth then add the cream and parmesan, blitz until smooth and creamy. Add extra salt if required. Toss the sauce through the cooked penne until evenly coated in the sauce. If the sauce is too thick dilute it will a little reserved pasta water (not too much). Serve with torn basil leaves. Tip: Always reserve a cup of pasta water before draining the pasta. If the consistency of the sauce is too thick dilute it a little with some pasta water (not too much).